One-story bungalow with a small addition at rear. Multi-gable roof with boxed returns. German siding on rear addition, brick veneer and shingles elsewhere. Wraparound porch has battered posts on stone piers. Cut stone foundation. Six-over-one windows; modern bay window at front. Door is multi-light-over-panel. Notable granite retaining wall at sidewalk level. 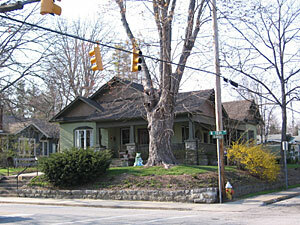 Frank P. and Annie K. Yarborough lived here from 1937 to 1938. Yarborough was employed at Duke Power Company. Samuel H. and Lillian B. Jackson lived here from 1939 to at least 1951. Jackson was an electrician. Modern metal storage building at rear with "gambrel" roof.